Regular phone calls are over--these days, it's all about video chatting. If you've got a smartphone, you're likely holding a video-chatting machine (in all its forward-facing 1.3 megapixel glory). And regardless of what OS your smartphone is running, it likely came with some built-in video chatting software. But what if you want to, I don't know... call someone on a different platform? Or what if you need to chat with your entire rugby team at once? Facetime only works on iOS, and Google Hangouts only supports 10 chatters at one time. If you're facing a video chat crisis, never fear--third-party video chat apps are here to save the day. These five cross-platform apps bring extra functionality, such as group video chats, video messaging, free texting, and cheap voice calls, to the table. If Facebook is your main method of communication, you may want to check out ooVoo. A free video chat app for iOS and Android, ooVoo also has a desktop client for PCs and Macs and integrates with Facebook. ooVoo also lets you group chat with up to 11 friends at a time (12, including yourself), which is two more friends than Google Hangouts supports (10, including yourself), and has a more robust social network to boot. 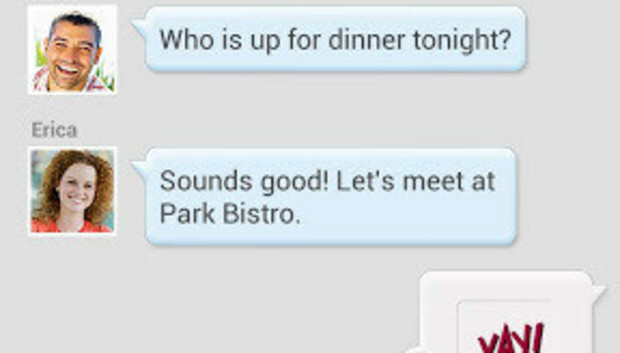 The ooVoo app is simple and straightforward on both iOS and Android. When you first download it, you'll be prompted to create an ooVoo account or login with Facebook. At the top of the screen, there are three buttons for your three different contact lists: ooVoo contacts, Facebook contacts, and All contacts (which includes your address book). At the bottom, there are five navigation buttons: Contacts, Phone, History, IM, and Settings. Multi-friend-chatting aside (you only see four people on the screen at a time, so it's not too overwhelming), ooVoo is a full-featured app that also offers voice calling and instant messaging. Voice calling between ooVoo contacts is free and unlimited, but if you want to call regular numbers (both cellphones and landlines), you'll have to cough up some cash for ooVoo credits. Credits work for calls to multiple countries (see a full list here), and rates start at around 1.8 cents per minute to the United States. Instant messaging is always free and works even when you're in the middle of a video call. Another neat ooVoo feature is the ability to upload an avatar photo and a status update, which your ooVoo friends will see in their contact lists. Tango is one of the most popular third-party video chat apps, and it's not difficult to see why: It's incredibly simple to use. Getting started with Tango is a snap--you don't even have to enter a password, just your phone number (which is already populated), email address, and first name to create an account. Tango offers video chat, voice calls, and instant messaging, but only with other users who also have verified Tango accounts. The good thing about Tango is that it's all free and unlimited--video chats and voice calls use your phone's data connection, so you don't have to worry about using up your minutes (though you do have to worry about using up your phone's data connection). The bad thing is that it only works with other Tango users (so no cross-platform chatting with WP8). It also lack an option to purchase minutes for calling cellphones or landlines that do not have Tango installed. While Tango has a few nice features, some of them cost extra. Though the video chat feature is the star of the show, Tango's regular chat is pretty neat too. In the regular chat you can share photos, videos, and voice recordings, and you can add multiple people (though you can't video chat with multiple people). Tango also has a store where you can purchase mini-games such as darts, reverse, and tic-tac-toe, which you can then play with other people during a video chat. On the surface, Fring is similar to the other video chat apps we've covered so far: It offers free, unlimited video chats, voice calls, and instant messages to other Fring users. But its real advantage is when you start making paid phone calls (also known as "FringOUT" calls) to cellphones and landlines around the world. Fring has one of the cheapest rate systems available, starting at just 1 cent per minute. To call U.S. landlines and cellphones, Fring charges 1.2 cents per minute. By comparison, ooVoo charges 1.8 cents per minute, and Skype charges 2.3 cents per minute (though, to be fair, Skype does offer a subscription rate of $2.99/month). Of course, before you decide which service to use you'll want to check out which countries you'll be calling most often--Fring isn't the cheapest for all countries. For example, Fring charges 3.7 cents to call to a Japanese landline, while ooVoo charges 2.1 cents (and Skype charges 2.6 cents). Fring also offers group video chatting (up to four people at one time). The biggest drawback of Fring is that you do need a phone number to set it up--the service sends a text to your number to verify that it's yours. So iPod Touch users will need to use a phone number that can receive texts and that's not associated with any other Fring account. Nobody to video chat with? Instead of chatting with friends and family, try chatting with total strangers on Camfrog. Camfrog is a free video chat app available for iOS, Android, and Windows Mobile users, as well as PC and Mac users. This app lets you find people to talk to--you can either join a public Camfrog chat room, or look someone up by username and chat with them privately. There are tons of public Camfrog rooms that you can join to talk about...basically anything. When you join a room, you'll see your video feed in the upper left corner. In the right corner you can swipe to access other people's feeds (you can swipe through all the feeds, but you can only see one at a time), and the lower half of the screen features a text chat. You can pause your feed, switch cameras, or talk to the room by tapping the speaker icon. It's not the best way to video chat, but if you're looking for new friends...it works pretty well. You can also make voice calls and sent instant messages to other Camfrog users. Unlike the other video chat apps in this round-up, Camfrog doesn't scour your address book for contacts--if you want to privately talk to another user, you'll need to look them up by their Camfrog nickname. Since Camfrog is more of a social network than a pure video chat app, you can edit your profile to add a profile pic, status update, marital status and what you're "seeking," occupation, home page, and you can also set your privacy settings. If you want to mix a little lifecasting in with your video chats, multi-platform video app Qik may be right up your alley. Qik is a free video app available for iOS, Android, and BlackBerry. It's not primarily a video chat app, though--it's more of a lifecasting app, or an app that lets you record moments and publish them to your very own live Qik feed. But it does have video chat functionality, including the ability to send video messages to offline users. Qik's main screen is just a view through your phone's camera lens. On this screen you can record videos using either the forward-facing or the rear-facing camera, and you can add live effects such as black-and-white, x-ray, mirrored, etc. Once you've recorded a video, you can name it, and share it on Facebook, Twitter, YouTube, or via email or text. Your video is automatically uploaded to your Qik feed, which can be viewed by other Qik users (you can also make your video private). If you'd rather video chat with a friend, tap the "Connect" button at the bottom of the screen. A new menu will open up with the typical video chat features: History, Contacts, Keypad, and Video Mail. Qik scours your contact list to see who already has Qik accounts; you can start video chatting with these people immediately. Otherwise, you'll need to invite your friends and family to Qik--it only works with other Qik users.